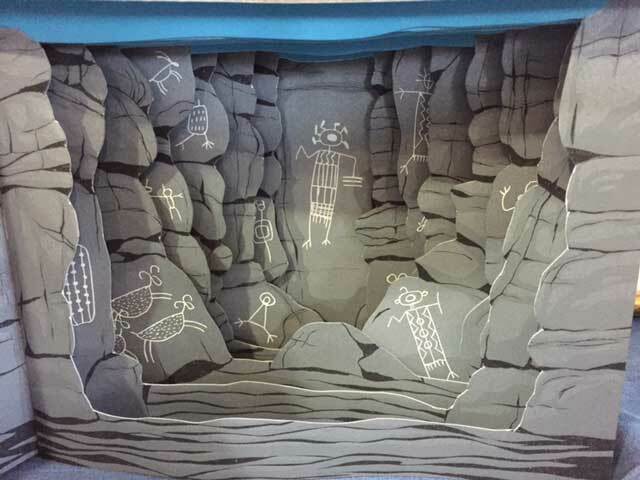 Let's kick off 2016 with an original WOW creation from Margaret Beech, our NORBAG member who lives in York, England. 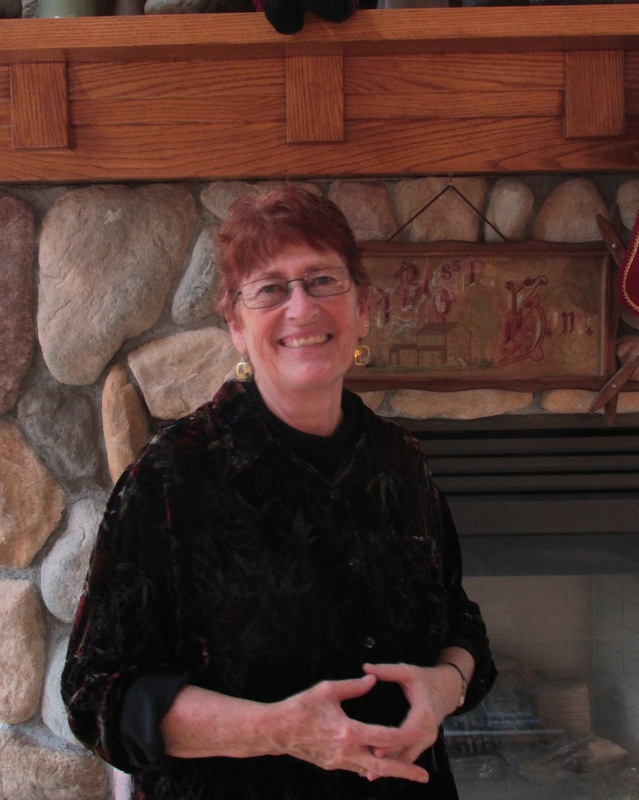 Dolores Guffey will stand in for Margaret to teach the workshop. It is a double-sided concertina with WOW explosion folds on both sides and decorated with a multitude of circles in vibrant colors. This structure can be made in any size and with any type of punch designs. ALL papers will be provided--you just need to bring your creativity. 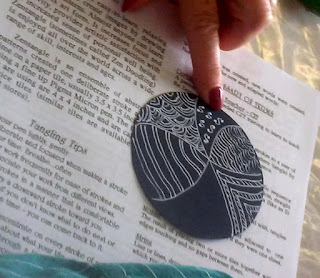 Small paper punches (there will be some to share at the meeting). Circle punches in various sizes from 1/4" to 2" as well as any other punches in any shapes in these sizes. RSVP: YES!!! Absolutely necessary as there are a lot of papers to be pre-cut. Please call or email Dolores no later than Tuesday, January 5. Her contact information is in the newsletter. Each December, we forgo our usual workshop and instead we exchange cards and have a social event. All members are invited whether they participate in the exchange or not. 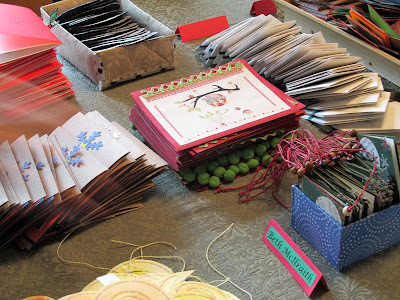 Each of us who sign up for the exchange make a card for the rest of the exchange participants. This year we made 29 cards. Generally each of us decides individually what structure and theme we will use. 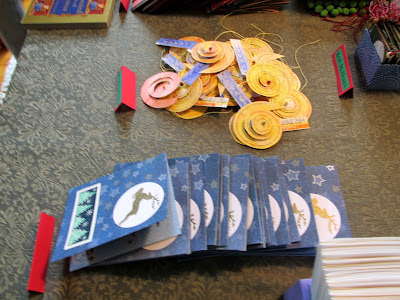 This year themes ranged from solstice to holiday cards. 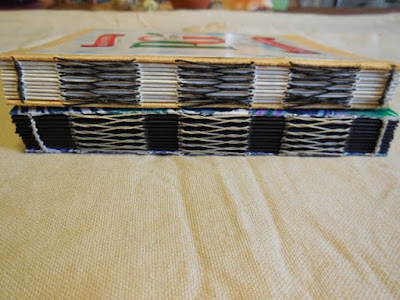 The card structures can take almost any form. We had conventional cards, ornaments, origami and explosion folds, and even a three dimensional box. 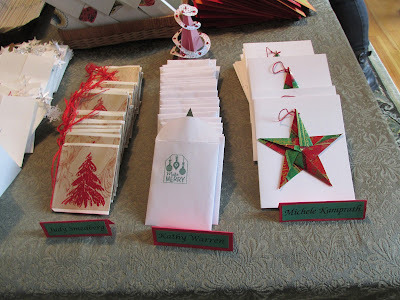 Cards were made with wrapping and scrapbook papers, art papers of all kinds, rubber stamps, colored pencils, glitter, pens, and new and recycled items. Digital arts, hand drawn and colored cards, and folded structures were represented. 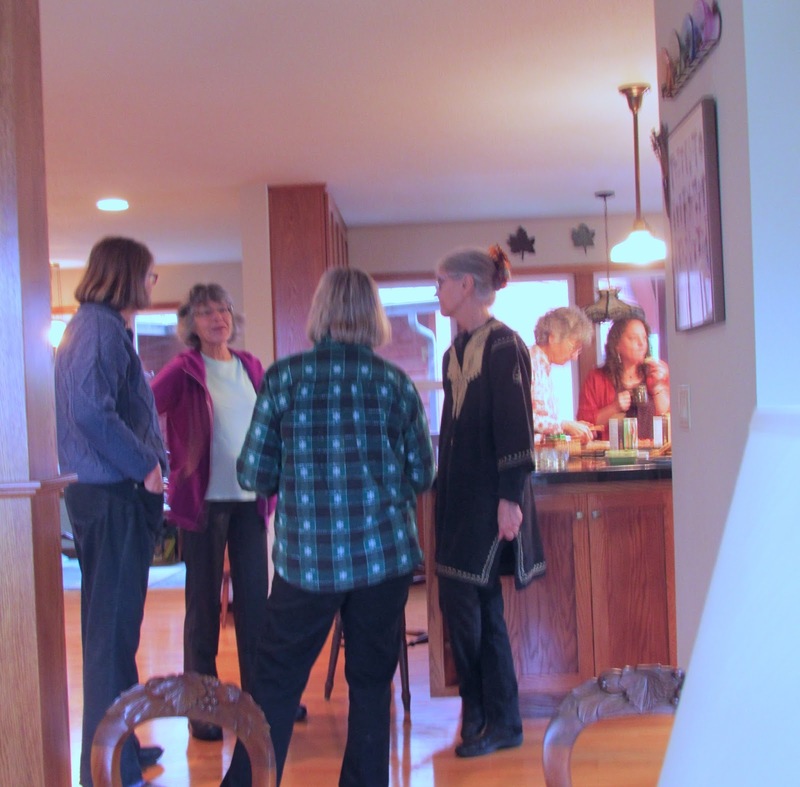 For the past several years, Sandy V. has hosted our get together in her home in Arcata, California. 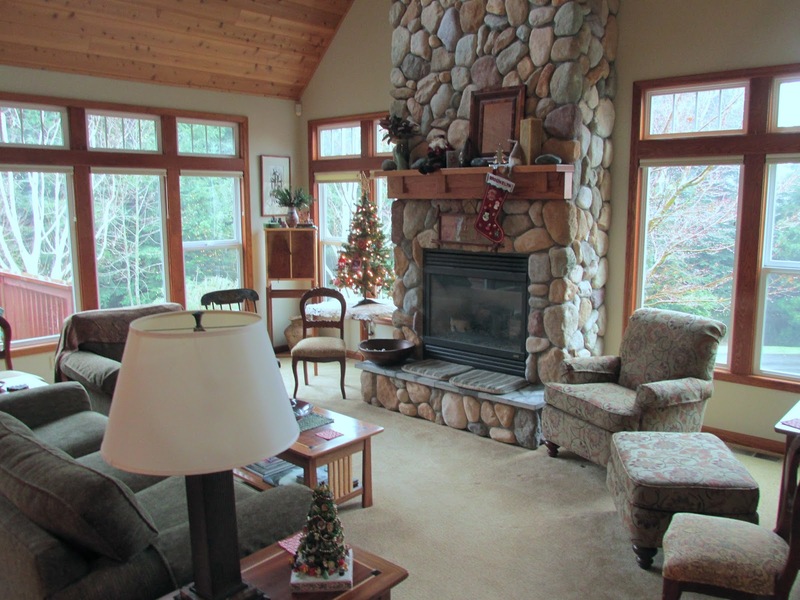 Her home is on a hillside and filled with windows framing the forest outside. We bring both sweet and savory goodies that are served in the kitchen. We gather in Sandy's living room and see the forest outside her windows. This year it was raining and the drops of water looked like crystals on the bare branches just outside the windows. Each year, Dolores sets up the dining room table for the actual exchange. 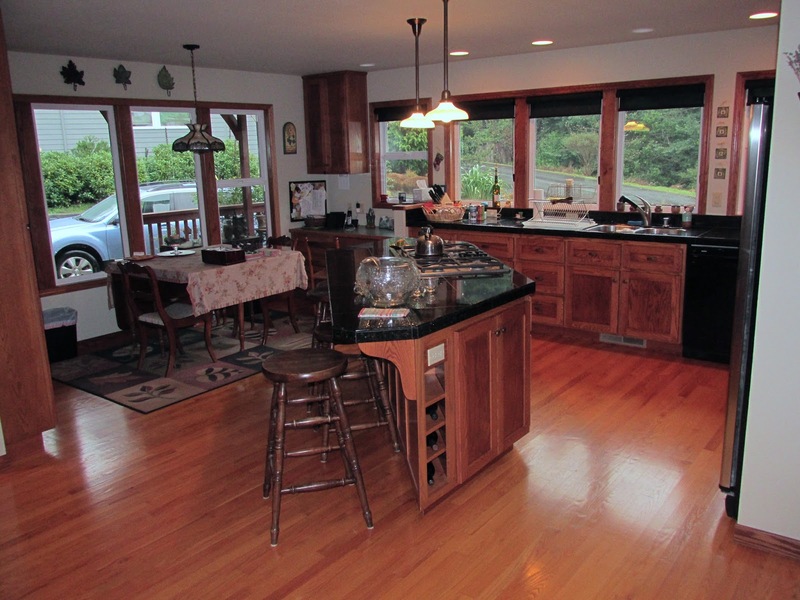 When we arrive, we put our edibles in the kitchen. 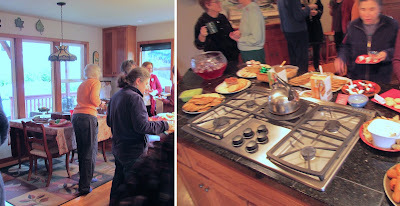 We cover two tables with sweets and savory items as well as coffee, tea and punch. 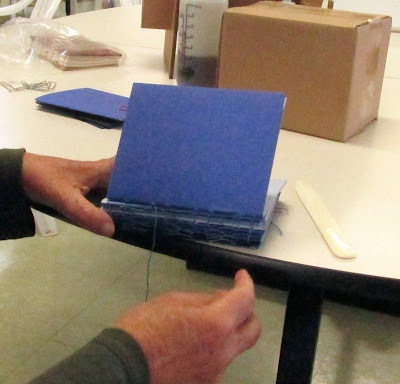 We put our cards on the tables and take a quick peek at them before the actual exchange. 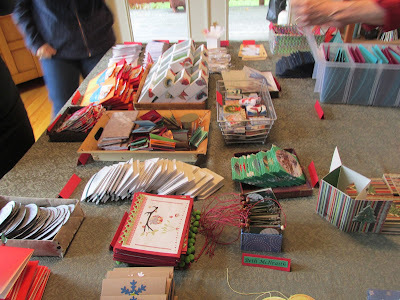 Then we take a bag and go around the table gathering one of each card. Our out-of-towners have bags that are filled by Dolores. 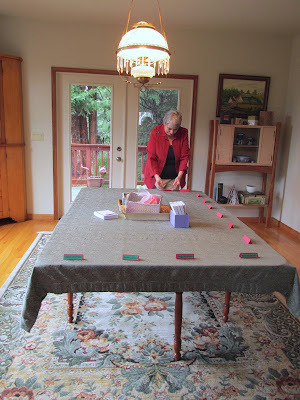 Once all of the cards are distributed, we sit in the living room and each member tells us how the card was made and the stories that relate to it. Dolores reads the colophons for the out-of-towners. 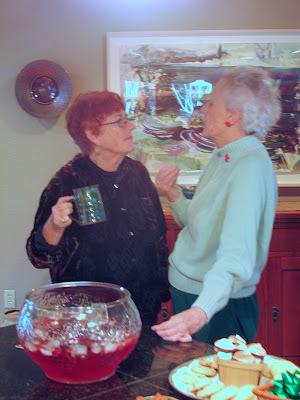 And then we chat some more. All of us wish everyone a great holiday season. 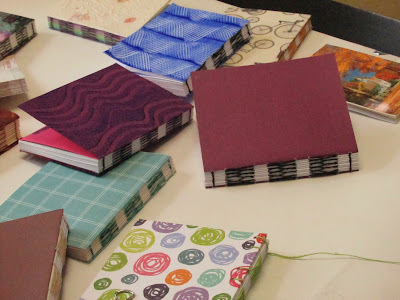 May you also have a wonderful New Year filled with book and paper projects! 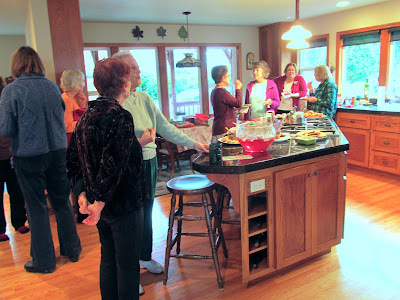 Standing: Becky M; Edge G; Kathy W; Vicki V; Miriam H.; Ellen G with Beth M behind her; JoAnn B; Peggy M; Alex S.
Seated in front: Lara C; Lynne G; Gisela R; Debbie K; Michele K; Michele O; Dolores G; Sandy W; Andy S; Susan B. Missing: Bobbie H., who took the photo. Just a reminder: The pictures of the exchange cards will be posted at the end of the month on Flickr. Just look to the left of this post and you can see "Flickr Photos" button. Click on that and you will see Ellen's photos. Also, the photos on this page can be seen in a larger format. Just click on them. 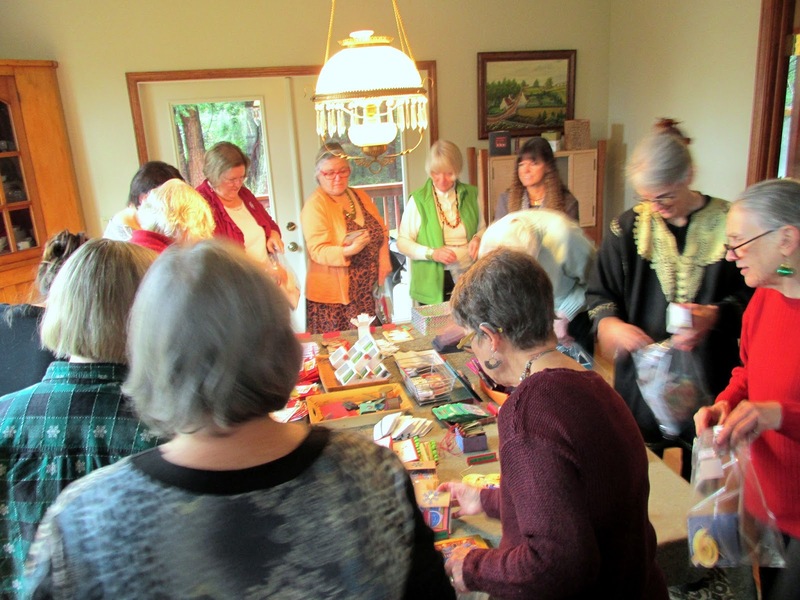 As you may have read in December's newsletter, a former member of Norbag, Marylee Bytheriver, closed her studio and donated many materials to the Guild. She passed away November 29. 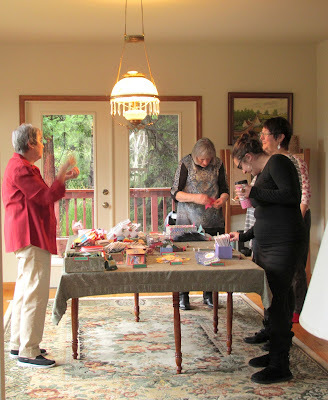 It was important to her that she give away items from her studio while she was well enough to do so. 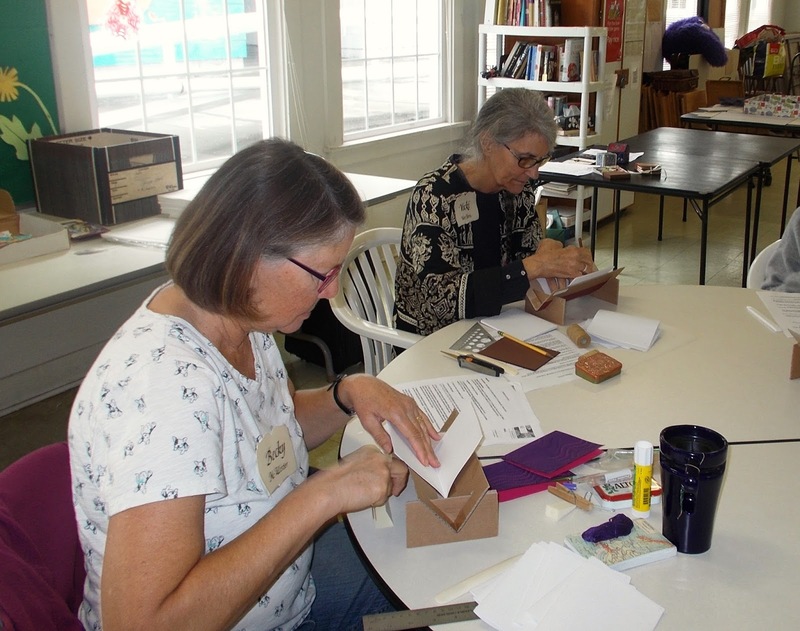 Some materials will be kept in a toolkit for members who need to borrow items for a workshop and other materials are being sold to members with the proceeds to be saved for a guest artist. 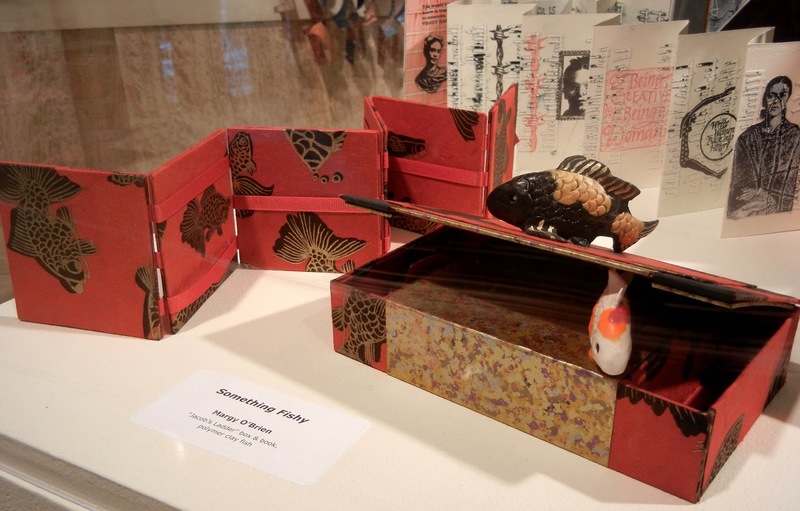 As with many of us, Marylee’s focus on book arts came later in life. 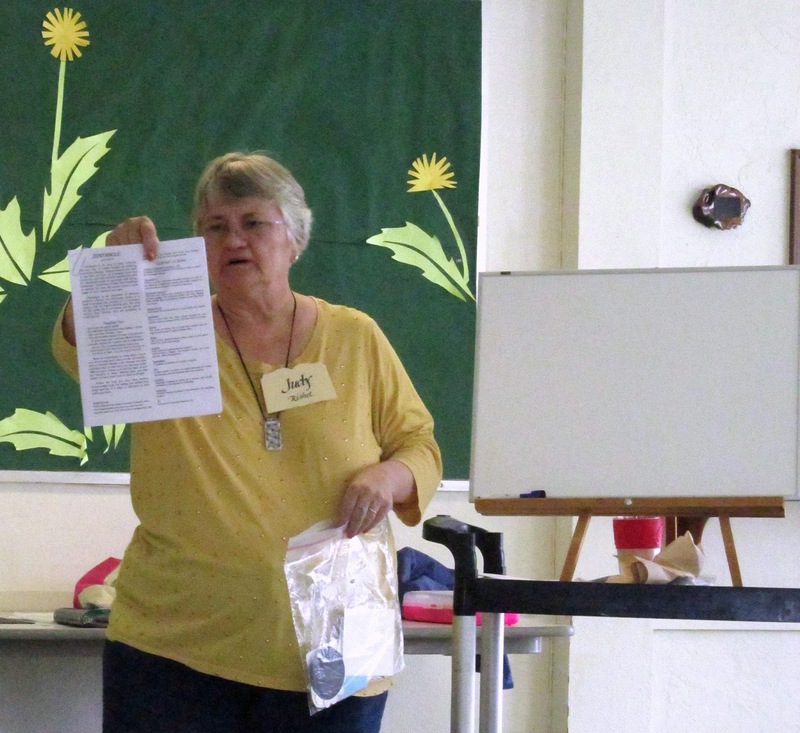 After a twenty-year break between her sophomore and junior years in college, Marylee return to academia to complete her B.A. 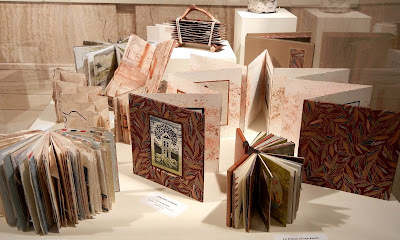 in Book Arts at Mills College, Oakland, California. She graduated with honors in 1991. 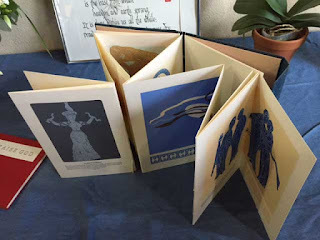 She established Lunation Press in Oakland, California, where she created books that were a tribute to her imagination and dedication to the environment. 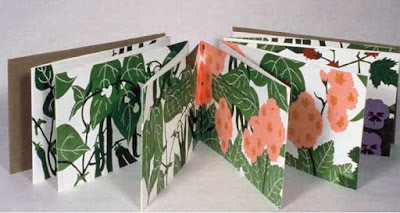 Her books can be seen in public collections nationwide including the National Gallery of Art, the Museum of Modern Art, New York, and the San Francisco Museum of Modern Art. Some books can still be purchased at Vamp and Tramp Booksellers, Birmingham, Alabama. Marylee was a skilled printmaker. 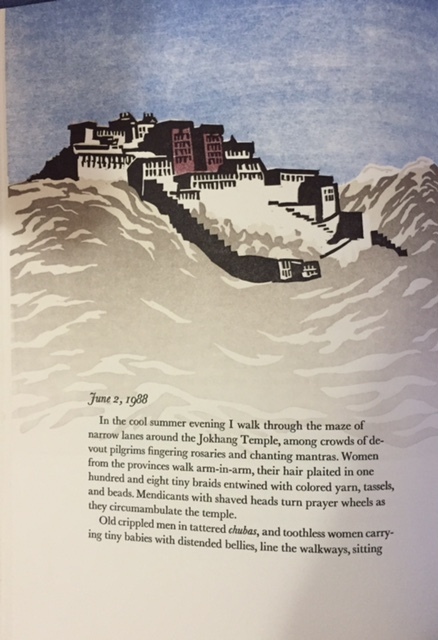 Many of her books feature her linoleum block prints. 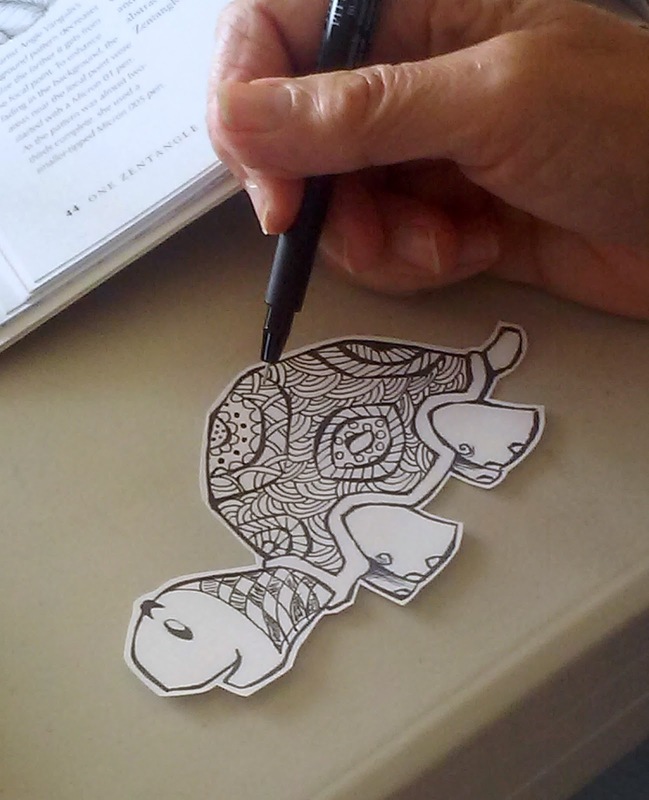 Today we honored her at our annual Holiday Card Exchange and enjoyed her beautiful book Venus on the Half Shell. Much of the research for this was done while she was attending Mills College. 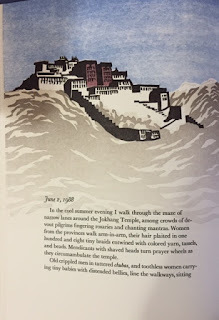 She spent time in Tibet and later created notes from a Tibetan Journey. 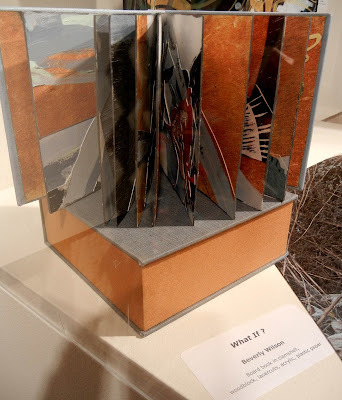 Marylee called this book Outsider Art and the tunnel book was created from photos of the Coso Range in Inyo County, California. Finally, she created a print of her beloved Lost Coast in Northern California. Apologies for my photographs! Lighting conditions were very challenging. 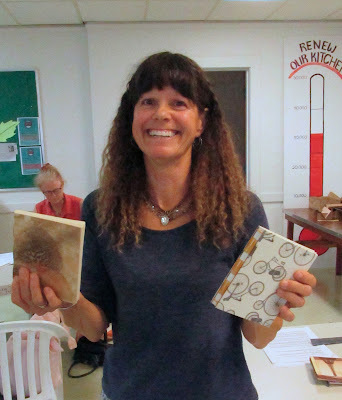 I will miss her enthusiasm for my new efforts at woodblock printing. It's time to get in the holiday spirit and join us for our annual Card Exchange event. Once again, Sandy V. has graciously offered her home for the celebration. All NORBAG members are invited, and remember, you do not have to be in the card exchange to attend. We only ask that you bring some type of finger food to share. 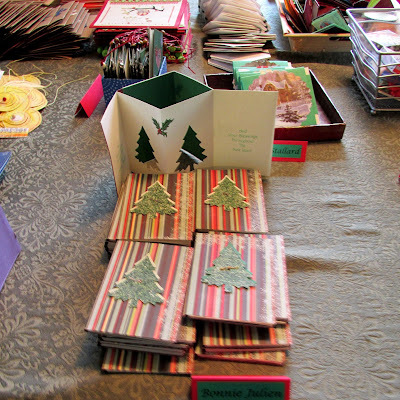 Pictured below are a few cards from previous holiday exchanges. We will not have the library at the gathering, but there will be a box so that you can return any books you may have checked out. There will also be a great selection of papers for sale that were generously donated by Marylee Bytheriver. Sandy has offered to welcome you early so you can look through and purchase these papers. We're very sorry to report that Marylee passed away last week. 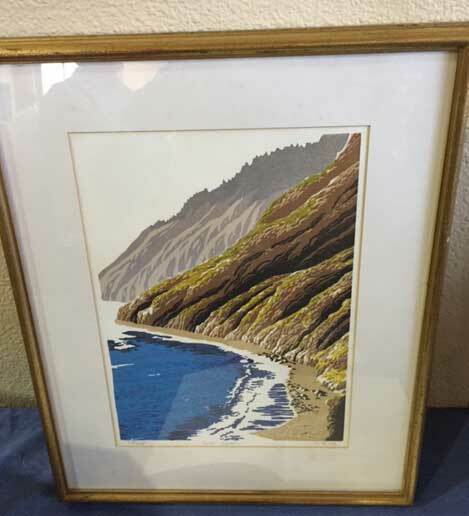 We plan to honor her work in art and the community in a future article. The money generated will be earmarked to aid us in bringing a visiting instructor for a future book arts workshop. RSVP? No, but you might contact Sandy in advance if you plan to come early to purchase papers. What to bring: Your cards if you are signed up to be in the exchange, and finger food to share. 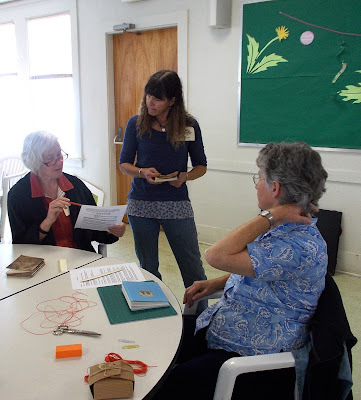 The November workshop was presented by Michele Kamprath. 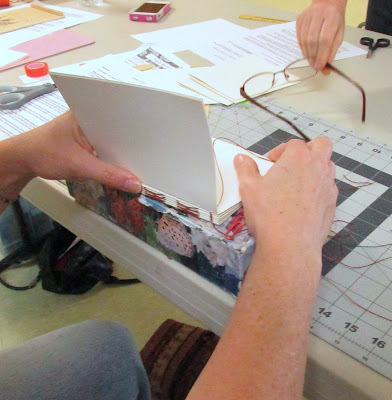 She taught the French Stitch binding for use on a 10 signature journal that was 4 ¼ inches by 5 ½ inches. 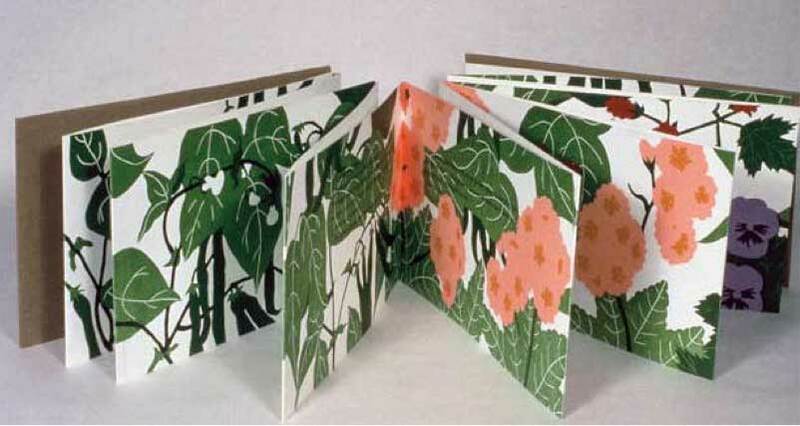 The covers were also paper (8 ½ by 5 ½ inches folded in half). Generally, the French Stitch is used when sewing onto tapes in a traditional case binding. 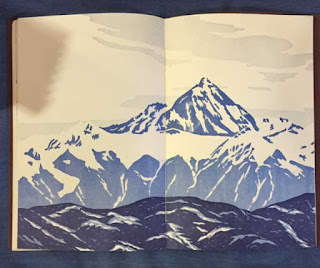 This gives the book a little more structure, but isn’t usually visible as it is hidden under the spine. Today book artists have integrated it into exposed bindings. We used the French Stitch with a kettle stitch at the end of each signature to give the book stability. Michele Kamprath brought several samples for us. We started by folding our covers and signatures. Then, using the sewing cradle and a jig, we put holes in the covers and signatures. We used a kettle stitch at the end of each signature and did the French stitch between. This is how the interior of each signature looked. 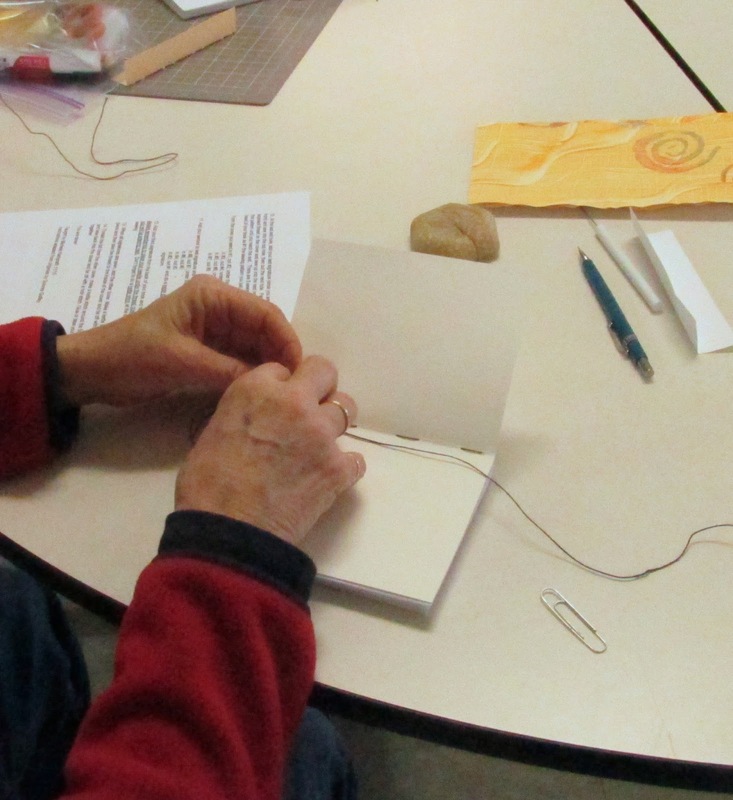 After finishing the signatures, we sewed through the cover and tied off our stitches. Here are samples of the covers and a peek at the French stitch on the exposed spine. Wow! That's more than a few French stitched spines. http://www.santafebag.org/#!2015-rotunda-show/c1zeu. 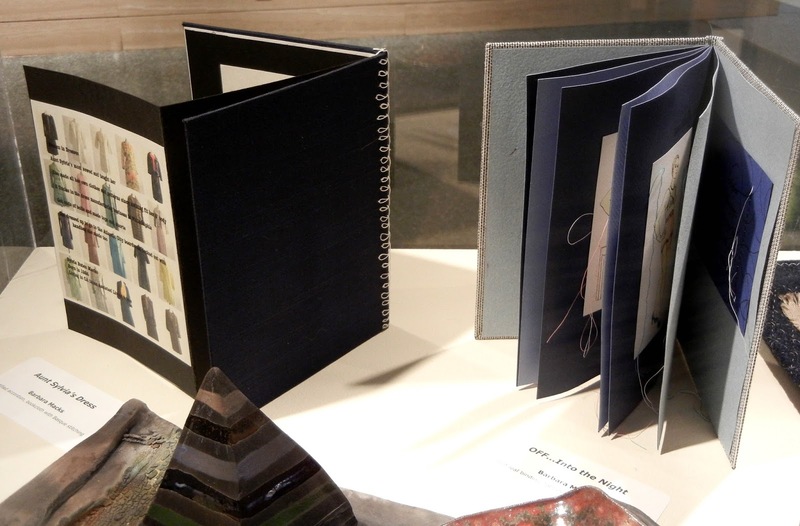 Congratulations to two NORBAG members, Barbara Macks and Beverly Wilson, who are also BAG members and have books in the exhibit. Running from September 4 through December 11, the exhibit features a wide range of events and activities open to the public. 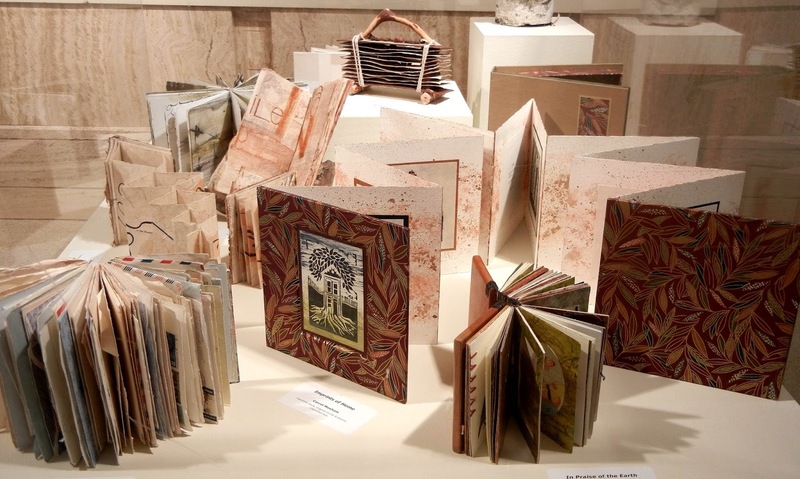 All of the 65 artists represented in the exhibit are members of BAG. 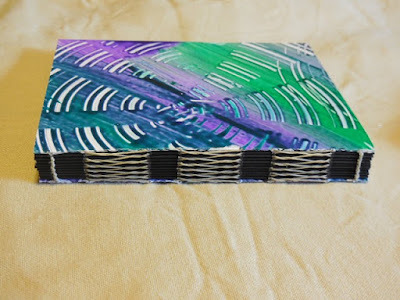 According to the website, "they all use a wide range of materials, designs, and techniques to create original works of sculptural or multi-dimensional book art. Dr. Cynthia Sanchez, Executive Director of the Capitol Art Foundation, is the curator and juror. 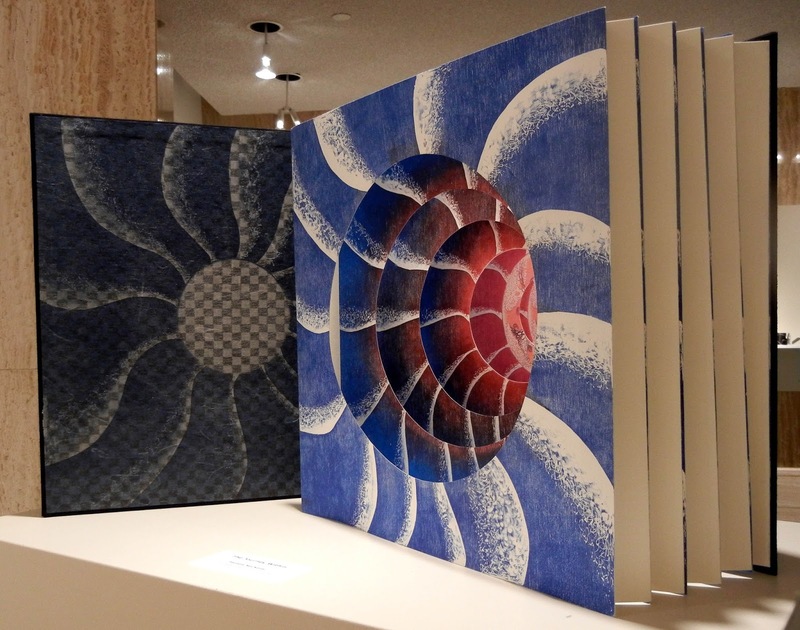 This is the sixth time that the New Mexico Capitol Art Foundation has invited Santa Fe BAG to exhibit. The exhibit is open to the public, weekdays from 9 am to 5 pm.” For more information about BAG visit their website at: www.santafebag.org. 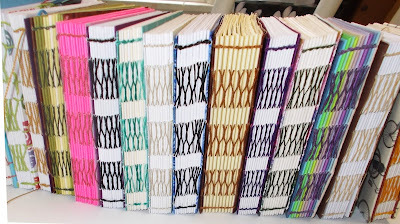 Come join us Saturday November 14 to make a small journal or blank book that is bound together with the lovely French Stitch binding. Your completed book size will be: 5 1/2 x 4 1/4 inches. You will need to cut your paper ahead of time. 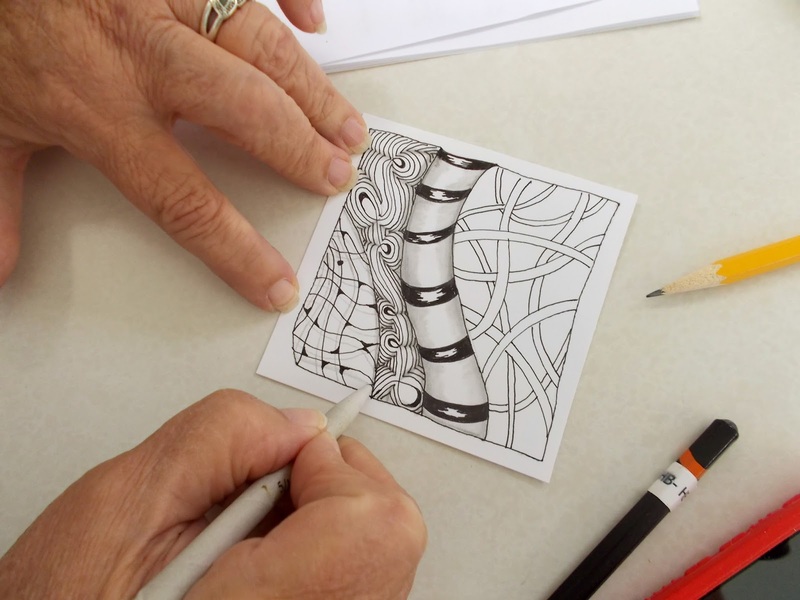 Judy Rishel lead us in the exploration of Zentangle. 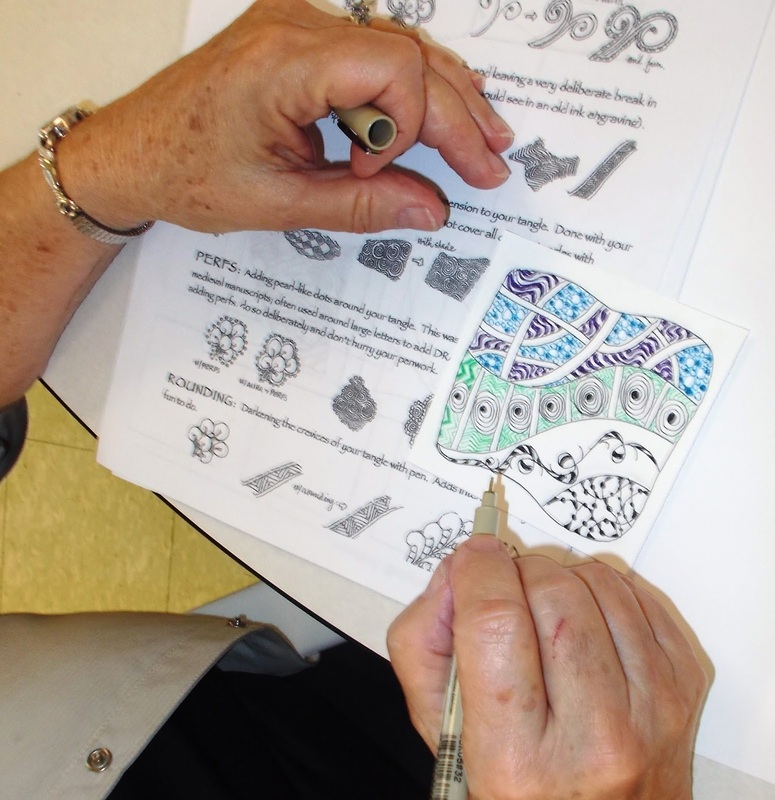 Judy's first exposure to Zentangle was at a 2013 NORBAG Zentangle workshop by Peggy Marrs. Later, Judy saw a Zentangle event at a conference she attended and was so interested that she took several classes. 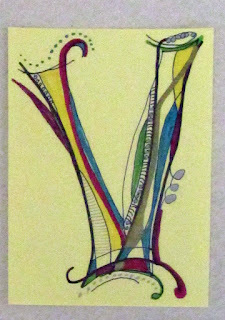 She feels it is "an art form that has exploded because you don't have to be an artist to do it! 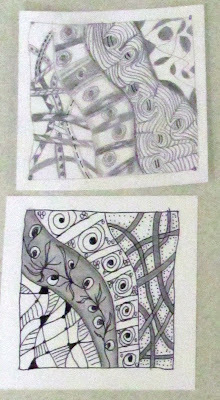 And there are no mistakes when doing Zentangle." No erasers, no rulers. 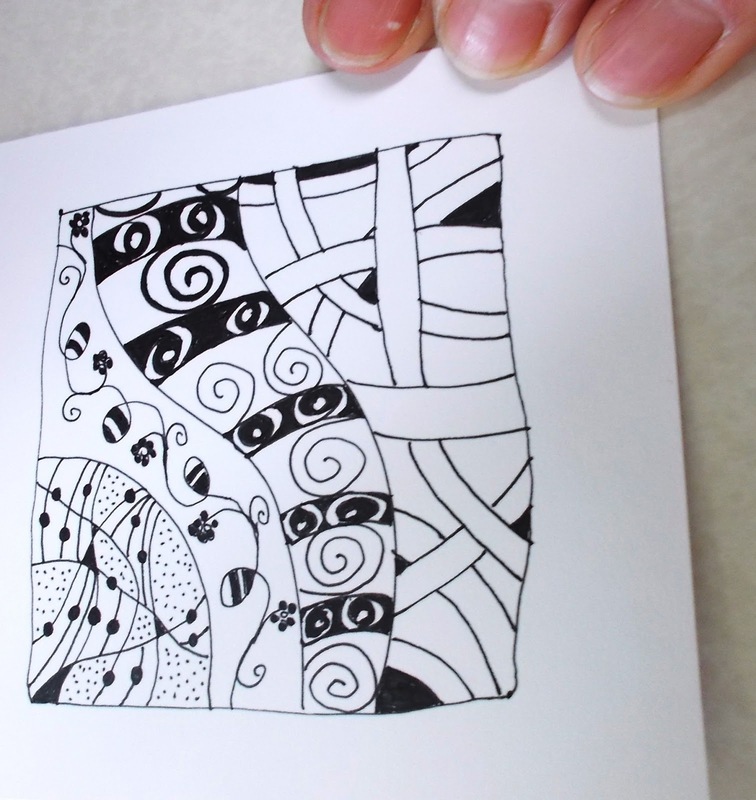 Just a pen, a small 3.5-inch square of paper and and a pencil for shading. 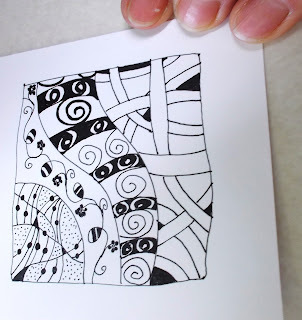 Zentangle is different from doodling. Doodling is random. It can be almost anything. Zentangle is abstract and uses repetitive patterns made up of one or more of the following strokes: a circle, a curved line (like a C), a reversed curse (like an S) a straight line or a dot. A pattern is formed and then repeated. 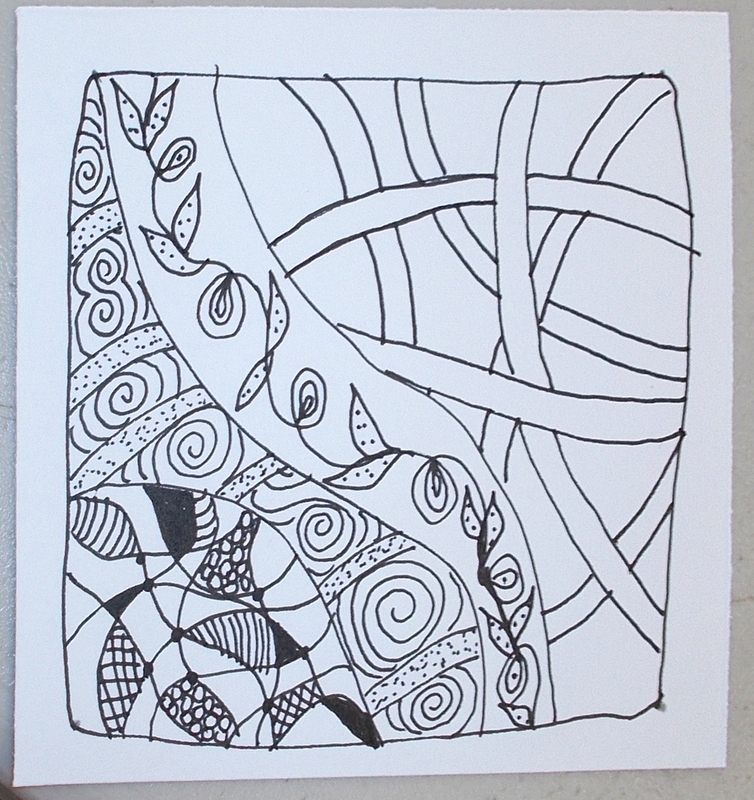 The object is to lose yourself in the drawing (Zen) without concern for the outcome. 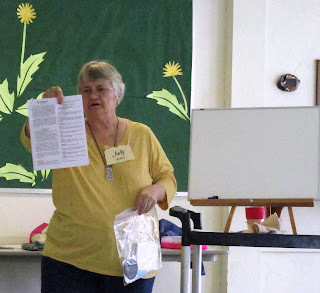 Judy provided us with a delightful materials kit. 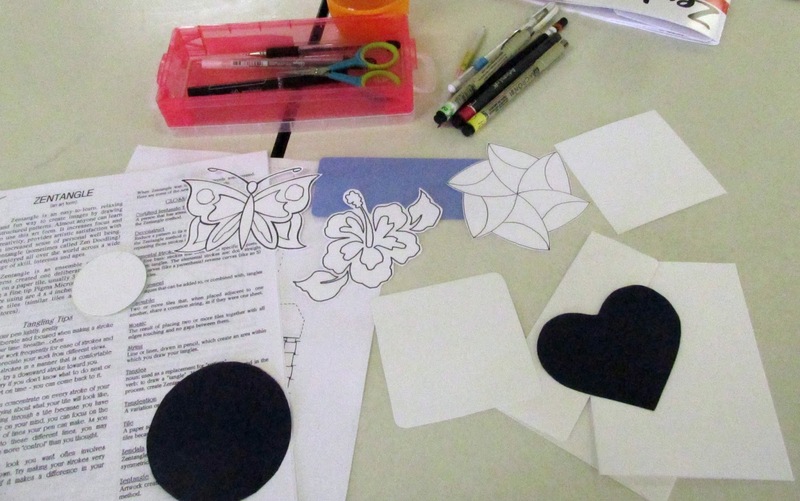 We had an instruction sheet with patterns to use, white and black tiles to draw on, pre-drawn shapes to fill in with Zentangle patterns and even a template for a box that we could decorate and use to store our tiles. 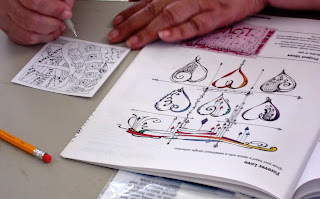 For reference, Judy brought commercial instruction books, and a number of her own notebooks demonstrating ways to keep your own finished pieces, works in progress and pattern samples and practice. Judy started the day with a white board. 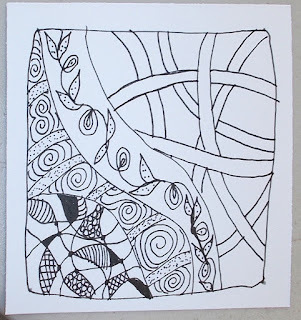 She drew three wavy lines (called a string) that we used to divide the Zentangle tile. Then she suggested four different patterns to use within those lines. And look at the variety of tiles that resulted. Color, black and white and pencil. And each one is unique. Judy's last words to us: "Remember, there are no mistakes, and don't forget to breathe." And then we did what we always do. 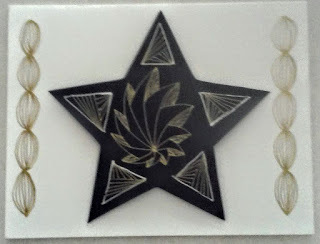 We laughed and played and made tiles. Our October Book Exchange theme was "Falling Leaves" or "Autumn Colors." You can tap the Flickr Photos button on the left to see them in color. Watch for the next workshop that will be shown here around the beginning of the month.